This past week, Project Rhino in partnership with Love Africa Marketing hosted key national and international media on a three day site visit in Zululand, KwaZulu-Natal. The objective was to give the media a real conservation experience to show them firsthand how much effort is still going into the fight against rhino poaching. It is a problem that has not subsided. The media week was hosted in the hope of enabling the media to tell the ‘action story’ around anti-poaching interventions and efforts in protecting rhino and other wildlife. “Not enough people know about the issues facing our wildlife, and if they don’t know, then we can’t expect them to care. The media play a vital role in creating awareness and this gave them an opportunity to see the incredible work on the ground” Nicola Gerrard, loveAfrica Director. The start of the media visit kicked off at Zululand Anti-poaching Wing (ZAP Wing) base in Hluhluwe Town, where they learnt about the importance of aerial surveillance in supporting the 25 member reserves in KZN. The aircraft is deployed daily to monitor large areas of land, while working closely with individual member reserves. In 2017 alone, a total of 246 hours were flown with a distance of 18,000 kilometres covered. The Project Rhino K-9 Unit was then introduced, and conducted a demonstration, highlighting the skill level of both handler and dog. Dogs have proved to be an essential tool to fight wildlife crime by tracking down poachers, detecting wildlife products and recovering illegal weapons and ammunition. The Project Rhino K9 Unit works closely with member reserves in the fight against wildlife crime. 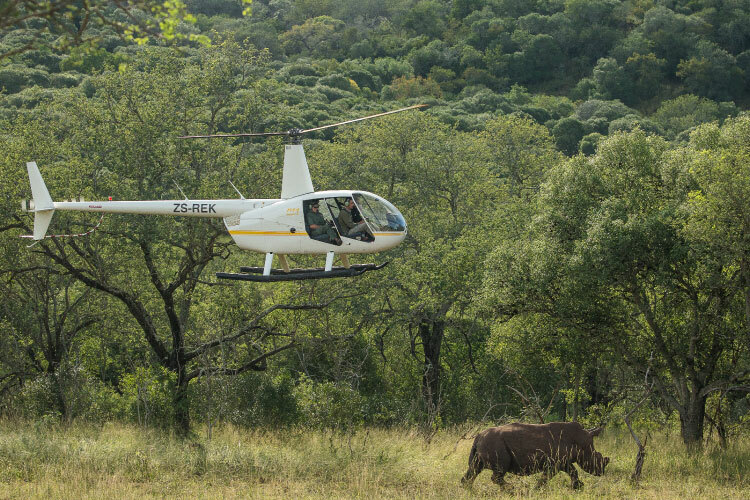 The following day, the media joined Project Rhino founder members; Wildands, WildlifeACT and the Emvokweni Community Trust (ECT) on Somkhanda Game Reserve where rhino were darted, dehorned and fitted with new trackers. During a dehorning activity, DNA samples are taken, and young “clean” individuals are ear-notched. This process enables the monitoring team to uniquely recognise the individual. “Wildlands and the Emvokweni Community Trust are extremely fortunate to be part of Project Rhino and Wildlife ACT to help us manage our rhino population at Somkhanda. We are also very grateful to the Green Trust and the Global Nature Fund who support our work in the neighbouring community, spreading the benefits of conservation to the owners of Somkhanda. All our partners immediately rallied to our cause when they learnt that we lost a rhino due to poaching last month and assisted with the safeguarding of the calf that was orphaned. Through this week’s operation they have also assisted us with ensuring all the rhino in the reserve are dehorned as a safety measure to poaching,” concluded Dr Roelie Kloppers, Wildlands Executive Director. The de-horning process was conducted by an experienced wildlife veterinarian, Dr Mike Toft and a team of specialists. The rhino were sedated and the horn removed and shaped to take off as much horn material as possible in a quick and painless procedure. The rhino horn is made of keratin, which is the same type of protein that makes up hair and finger nails. The horn regrowth should be trimmed approximately every 18 months to deter poachers. This costs an average of R9 000-10 000 per rhino. “Wildlife ACT assists with ongoing daily monitoring of both the white and black rhino populations, making use of state of the art technology in the form of tracking foot collars that Wildlands and the ECT elect to fit to every single rhino. These measures, in conjunction with high field ranger densities, mean that the risk of poaching to this important population is greatly reduced,” comments Taryn Gilroy, Wildlife ACT Director. On day 3, the conservation in action team visited the Hluhluwe-Imfolozi Park Horse Unit, which was initiated by the NGO 12 Hours. 12 Hours together with Project Rhino facilitated the revival of the unit in 2017. The horse unit now consists of 7 horses and 5 rangers who patrol up to 30 km per day. These rangers are able to cover long distances on horseback and access areas that are not ideal on foot. “Project Rhino, now in its 7th year, continues to bring together organizations with a common vision and goal, identifying synergies through an integrated, common approach and is collectively a representative body that carries powerful leverage ability. We will continue to work towards the ultimate goal of stopping wildlife crime”, added Project Rhino Coordinator, Chris Galliers. A huge thank you goes to On Safari Africa for transporting the media to and from King Shaka Airport, LoveAfrica Marketing, Wildlands, Wildlife ACT, Green Trust, Global Nature Fund (GNF), Ezemvelo KZN, Africa Conservation Trust, Grant Fowlds and Emvokweni Community Trust for being our long term partners in conservation, protecting our heritage and fighting wildlife crime.